During the H-alpha survey of the Galactic Plane (IPHAS, www.iphas.org) carried out at the Isaac Newton telescope, a remarkable planetary nebula was discovered. It was named as the Necklace nebula for its prominent ring of bright knots. The nebula also displays a pair of jets moving in the direction perpendicular to the ring. The formation of asymmetric structures such as rings and jets in planetary nebulae (PNe) has been a matter of debate for a long time. The most popular hypothesis is that these features are produced in interacting binaries: indeed, time-series photometry of the core of the Necklace revealed a close binary star at its centre, with an orbital period of 1.2 days (Corradi et al., 2011, MNRAS, 410, 1349). This implies that the system has gone through a common-envelope (CE) phase right before the nebula ejection. Therefore, the Necklace nebula is one of the first few PNe for which a clear association between jet's production and binarity has been established. 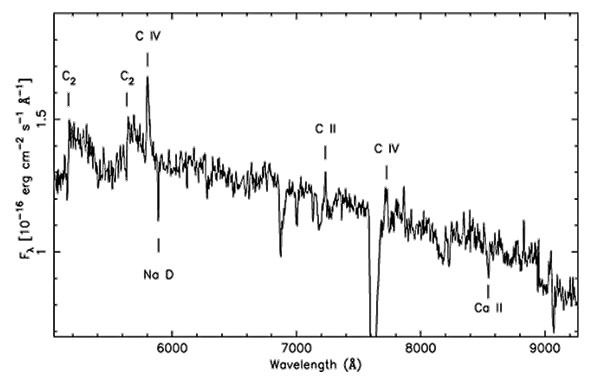 In addition, deep VLT+FORS2 and WHT+ACAM spectra revealed that the secondary star of the Necklace binary system is a carbon dwarf (Miszalski, Boffin & Corradi, 2012). As carbon is not produced in unevolved stars, the secondary star of the Necklace must have accreted it from the primary, presumably from its wind when it was an AGB star, and during the accretion process, the jets would have formed. For the first time, jet ejections can therefore be reliably related to accretion onto the secondary star of the system right before the CE phase, as predicted by some models. The kinematical age of the jets, larger than the age of the main body of the nebula, which is supposed to be ejected during the short CE phase, also supports the hypothesis of pre-CE accretion. In addition, the carbon-rich nature of the secondary star of the Necklace challenges the existing models of carbon dwarf formation and CE evolution. Its short orbital period of 1.16 day, is in fact only marginally reproduced by the existing carbon dwarf population models. ACAM spectrum obtained at inferior conjunction of the secondary star of the Necklace binary system. At this phase, the side of the secondary that is not irradiated by the very hot PN central star faces us, and reveals its carbon-rich nature, as revealed by several molecular bands and ionized atomic lines. [ JPEG ]. Miszalski, B., Boffin, H.M.J., Corradi, R.L.M., 2012, "A carbon dwarf wearing a Necklace: first proof of accretion in a post-common-envelope binary central star of a planetary nebula with jets". MNRAS, 428, L39. Paper. Corradi, R.L.M., Sabin, L., Miszalski, B., et al., 2011, "The Necklace: equatorial and polar outflows from the binary central star of the new planetary nebula IPHASX J194359.5+170901", MNRAS, 410, 1349. Paper.